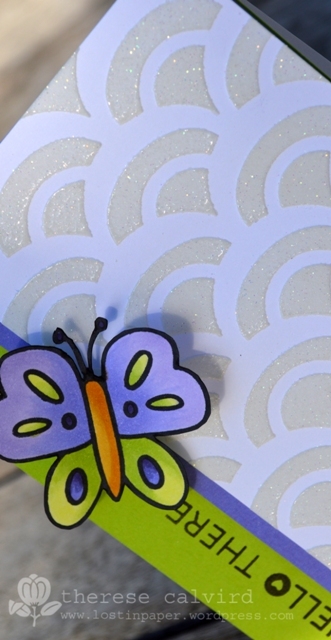 Sparkle Embossing Paste Background – Guest Tutor! I was lucky enough to have this card published as a Guest Tutor for the Australian Cardmaking, Stamping & Papercraft magazine recently. This is a fun idea that I learned from the genius of all techniques Jennifer McGuire, thank you yet again! I’m having such a relaxing time on my holidays, slowly ticking of the ‘very long’ list of things to do (ie I’ve cleaned out my craft cupboard, phew! ), heading out for lunch by the beach, catching up with friends and even seeing some movies….. I will be back real soon, I have another video mini series starting next week and I can’t wait to start sharing it with you. Other Supplies: Palette Knife. Copics – BV00,02,08. YR24. Y26. YG00,03. 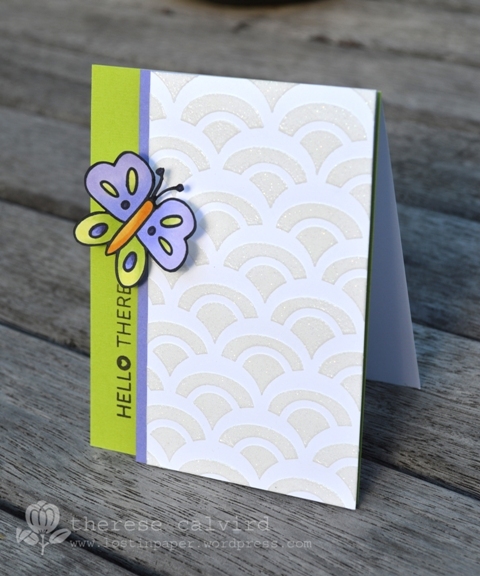 Cardstock – Pansy, Key Lime. < Previous Blooms at Purple Onion Designs (video)! Next > Addicted to Die Cutting – A new Mini Series (video)! Great card. Enjoy the holidays. School holidays started and we had home made pizza (including the dough) here last night. Enjoy your holiday, and we’ll see you soon! Again a beautiful card Theresa! I have that stencil but didn’t use it yet, so thanks for inspiration. I also checked your earlier blokposts. All cards are so lovely and inspiring! The one for Bev is my favorite!! Enjoy your holidays!! Super gorgeous! Love the sparkles!